Ricky Topham delivered on his promise to boss Rob Kenworthy as Calder 76 maintained their fine start to the Halifax AFL season last Friday. The Valley team won 4-1 on a tricky-looking trip to Northowram, where they suffered a rare defeat in the second half of last season. Topham duly bagged three goals at Northowram Rec as his side hit back from a goal down to comfortably foillow up their 4-0 opening day derby victory against Hebden Royd Red Star. Shaun Popek drew first blood for the Rams, who were playing their first game of the season, after half an hour. 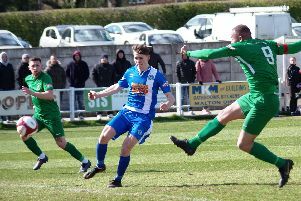 However, Topham scored a deserved equaliser and gave Calder just the fillip they needed a minute before half-time with a shot which flew into the bottom corner of the net. Calder then took control down the slope. Kieron Sim blasted the ball through a crowd of players for his first goal for the club in his second season. Topham headed his second and after the home side had missed a couple of good chances, the striker completed his hat-trick with a penalty after a foul on Remi Allen. After two away games, Calder host a Copley United side making their seasonal debut tomorrow (Fri). Sam Taylor and first choice goalkeeper Warren Clayton are expected to return.